Jorah comes straight from the Old Testament to Game of Thrones. What’s not to love? Thanks to Vanessa for suggesting a name she’s considering for her new son as our Baby Name of the Day. There’s a single reference to Jorah in the Old Testament. It comes in the Book of Ezra. It mentions that he claims 112 descendants, but says nothing more. Well, we know his family returned from exile in Babylon. Possible origins and meanings for the name abound. Harvest and autumn rainfall are frequently mentioned. So it’s authentically Biblical, but difficult to guess at the name’s precise origins or meaning. While we’re visiting the distant past, here’s an interesting coincidence. There’s a Canaanite moon god whose name is sometimes written Jorah. 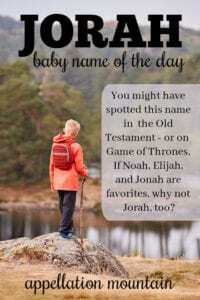 Most often it’s Yarikh, which doesn’t look exactly the same. But it’s clearly linked. While none of the gods in their pantheon are household names, scholars know a good bit about Canaanite religion. Yarikh was known as the illuminator of the heavens. Their faith evolved starting sometime in the early Bronze Age – perhaps as early as 3000 BC – so it’s ancient, indeed. The ties to the night sky could put this name in the company of other mythological choices, like Luna and Orion. While Mormont isn’t among the best-known characters, he appears in every season so far. Scottish actor Iain Glen plays the part. When the series debuted in 2011, Jorah was given to fewer than five boys in a single year. By 2017, that number reached 22 – a new high. Of course, it’s not just the mega-hit television series pushing this name up the popularity charts. In recent years, Noah has held the #1 spot in the US. 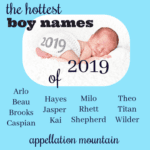 Other ends in -ah names for boys have been big, with Elijah, Isaiah, Josiah, and Jeremiah in the current US Top 100, and Micah, Jonah, and Judah not far behind. 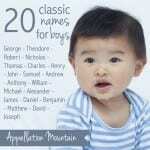 In general, boy names ending with -a feel far more mainstream than ever before. 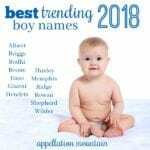 Besides the Old Testament names, romance language picks like Luca and place names like Cuba and Dakota have helped change the way we hear boy names. 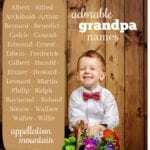 Speaking of sound, one possible downside: this name does end with favorites for girls, like Nora and Cora. But so far, the numbers give this one to the boys. And here’s where the fictional character really does help – it makes it clear that Jorah is masculine. 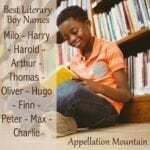 If you’re after a rare boy’s name with history, and appreciate the pop culture tie-in, then this is one to consider. Would you consider Jorah for a son? Not sure you can consider Luca a romance languages name. The name was well used earlier (Lucas the Evangelist, and the first occurrence seems to be in the Aeneid). At least in Italy, we consider Luca a New Testament name (it could have been used already in the “Luca” form as a hypocorism of Lucas). Anyway, I really like all these names and considering Luca for my baby due in a couple of months. Living in the US though, I’m very worried about the name shifting to the girls 🙁 Thanks for all your posts!